At YCIS Silicon Valley, we believe that learning should be joyful, active and meaningful. Students in Kindergarten through Grade 5 develop their sense of identity, build strong foundations of skills they will need throughout life, and learn how to be caring and compassionate citizens. Supported by their teachers and parents, YCIS students forge a path to becoming people of character and integrity, who know themselves, who are confident in their capacities, and who strive to make a difference in our global world. With a focus on active and cooperative learning, students question, investigate and develop their critical thinking and problem-solving skills through a challenging, engaging and well-rounded curriculum that brings together the best of the East and the West. Students acquire strong literacy and communication skills in two world languages, English and Mandarin. They deepen their understanding of the world through math, science and social studies. They express themselves creatively through art and music. They learn what it means to live character traits by helping others through service projects. They expand their horizons by exploring international cultures, customs and perspectives. Elementary students build the capacities, knowledge, and independence they will need to transition to the middle school years. The school day is 8:15 to 3:15 p.m. After school enrichment classes and an extended day program are available until 6:00 p.m.
Each day begins with a Morning Meeting with English and Chinese co-teachers leading discussions and activities to build community and connection. Students spend part of their day learning Chinese with their Chinese teacher (about two hours in Kindergarten and 80 minutes in Grades 1-5) and the rest of the day with their English teachers for math, science, social studies and English language arts. Specialist teachers teach violin, art and physical education. Chinese and English co-teachers collaborate to teach a bilingual East Meets West class as well as our Social-Emotional Learning curriculum. The day includes a morning break for snack and recess, an hour-long lunch and recess break, and an afternoon recess. Through a well-rounded academic program, students find their passions and explore their interests within the context of a challenging curriculum and a safe, nurturing learning environment. The YCIS Silicon Valley curriculum is aligned with US national and California state educational standards. Using their knowledge of their students’ interests and learning styles, teachers design creative projects and learning experiences to support the curriculum. At YCIS, math means fun. It is not just about cracking open a textbook and crunching numbers. The Singapore Math program we use emphasizes hands-on learning and combines eastern and western approaches to developing computation, problem solving and creative thinking skills. Students’ math development is enriched through games and learning centers, access to digital learning platforms, extra-curricular clubs and contests. With math taught during the same hour each day for Grades 1-5, students with exceptional achievement in mathematics may be eligible for accelerated instruction based on assessments and teacher recommendations. Students learn science by doing science. Based on the premise that science should be collaborative, hands-on and encourage the critical and creative thinking skills for success in the 21st century, the FOSS Science program gradually builds students’ skills in the scientific process: to observe, to think, to test and to explain. With a multimedia approach, the FOSS program integrates reading, writing, and mathematics, and extends classroom learning outdoors. In English Language Arts (ELA) students explore a wide variety of genres, writing styles and perspectives in fiction and non-fiction reading and writing. Teachers use a range of resources for reading and writing development including The Reading & Writing Workshop, Guided Reading and Words their Way programs. Reading instruction is differentiated to ensure students develop independent skills at an individually appropriate pace and level of challenge. In writing, students gain confidence and skill with the process of writing while developing their creative expression. Whether it is a Kindergartner proudly showing off a self-published “book” to parents at a publishing party, or a fourth grader exploring the power of poetry, each student learns to express him or herself critically and creatively through language. In Social Studies, students develop critical thinking skills used by historians and social scientists to learn about the past and connect it to the present. Students also develop their understanding of what it means to be a responsible citizen at all levels of human organization beginning with the self and family and moving outward to the world. Creative cross-disciplinary projects, such as the third grade class economy, help students integrate many skills. A cornerstone of a YCIS education, the Chinese Studies program inspires a love of language learning and a deep understanding of Chinese culture. 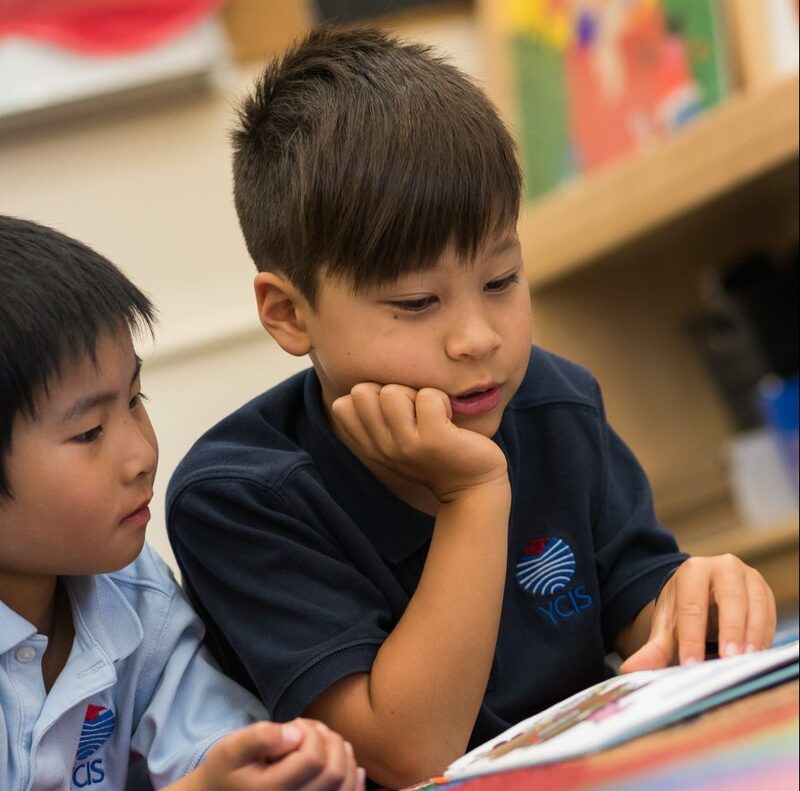 Carefully structured to build fluency in speaking, listening, reading and writing Mandarin, the curriculum is flexible to meet the learning needs of both heritage and non-heritage language learners. Students have the choice to learn either simplified or traditional characters. Teachers use a range of resources including leveled textbooks, enrichment materials, and digital learning platforms along with creative interactive teaching approaches. Older students are assessed annually with the AAPPL test of the American Council on the Teaching of Foreign Languages (ACTFL). With a global focus, Music introduces students to a wide variety of musical styles, genres and composers. A hallmark of a YCIS education, the violin program for young students in Kindergarten through Grade 3 enhances children’s reasoning skills, builds teamwork, and develops patience, concentration, coordination and discipline. Students build on their violin training with music theory and appreciation in Grades 4 and 5. Students showcase their musical talents in school concerts and public performances. Students may also join a choir or orchestra after school. Through the Arts, children gain confidence in self-expression, grow creatively, develop verbal and non-verbal communication skills, focus better and persevere, and experience new perspectives on the world. 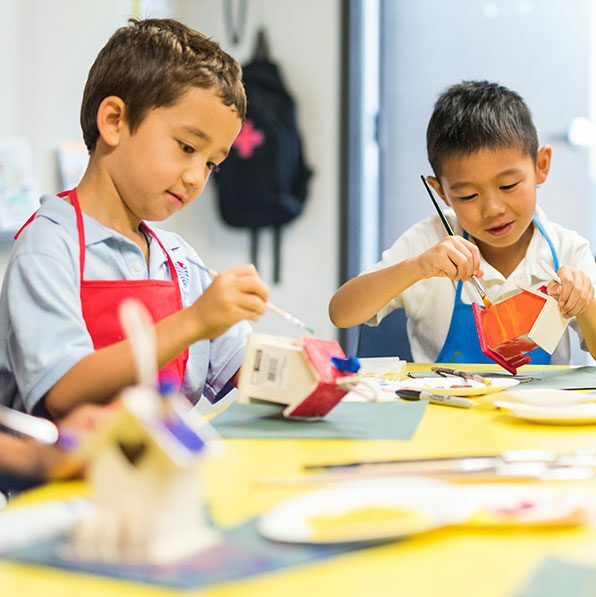 Taught in Mandarin, Art classes offer a global focus exposing children to artists, styles and works of art throughout world civilization. Students explore a variety of mediums and techniques to create their own visual art projects that are often displayed around the campus. Through regular physical exercise and exposure to a range of sports, children improve dexterity and agility, learn teamwork and good sportsmanship, and develop habits for a healthy life. During PE, students develop fine and gross motor skills, while learning the fundamentals of various team and individual sports and activities. Intramural sports are optional and available for students in Grades 3 to 5 during lunch recess. Character development is the heart of a YCIS education. Using a common language for reflecting on values and character traits, teachers support children’s development of a strong inner moral compass and as thoughtful, compassionate and respectful individuals. English and Chinese co-teachers collaborate to teach the Second Step program for social-emotional learning (SEL). With songs, games and activities, students grow their abilities to make friends, handle their emotions and solve problems. Character traits are celebrated and reinforced throughout school life as children develop values such as Respect, Responsibility, Creativity, Gratitude, Generosity, Commitment, Kindness, Patience, Peace, and Honesty. Classes take turns preparing a bilingual character trait assembly for the school and many initiate community service projects. Students must be technologically fluent and agile for a fast-changing world. While hands-on and cooperative learning are essential, technology also gives access to resources and provides different perspectives that can engage a wide range of learning styles. SMART Boards, 1:1 Chromebooks (Grades 3 and up), iPads (1:4 in Grades K to 2), subject-specific software such as iXL, Raz Kids and iChineseReader, and other technologies offer students opportunities to enhance and expand their learning while applying technology to produce their own work. Co-taught bilingually by English and Mandarin-speaking teaching partners, the East Meets West class allows students to explore, contrast and compare Eastern and Western perspectives, values and cultures in a bilingual project. Whether going on a nature walk to collect samples for a science project, or creating a bilingual skit to demonstrate a character trait, students extend their vocabularies and their viewpoints. YCIS students have ample opportunities to travel across town and across the globe to make connections and memories of a lifetime. Field trips bring classroom learning to life. Whether visiting a California mission for social studies, shopping for ingredients at a Chinese store for a cooking project, or donating used blankets for animals at the Humane Society, students connect what they learn to life beyond the classroom. Recent field trips have included Angel Island, Mission San Juan Bautista, Oakland Zoo, Deer Hollow Farm, Hidden Villa, Humane Society, Suessical, the Nutcracker Ballet and even the local fire station. Fifth graders attend science camp at Walden West and travel to Beijing for the 5th Grade Class Trip to China. Give your child the confidence to explore, adapt and succeed as a globally aware citizen of our world. Learn more about YCIS. ©2019 Yew Chung International School of Silicon Valley. All rights reserved. YCIS is a non-profit 501(c)3 school. Legal Information.